K-Pop is known to have lots of boygroups and girlgroups and bands of all sorts. Because of this large number, it’s a wonder to many fans how companies name their groups and how they want their group to stand out. When the group “Alphabat” came out one day in Allkpop, I was like “WHAT?”. Are they actually losing some ideas? 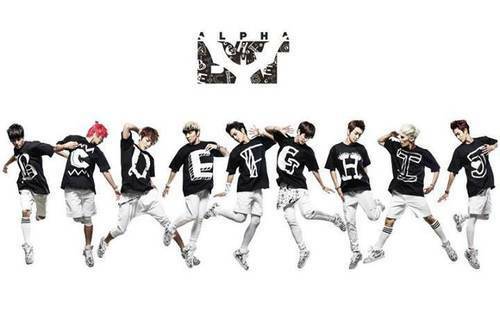 Alphabat just released their debut MV. For a debut MV, this is expected. It’s not really that explosive and offered almost to nothing new to K-Pop. Electric, hip hop and aegyo are very common. The song starts with a rap. It was a pretty decent rap and he sounded like TOP but kinda some timbre higher. It didn’t have the “I’ll-blow-your-mind-with-my-lazy-rap” in it. It was normal. Then it was followed by a slower tempo singing and falsetto. I like the falsetto that I kept on replaying that part. Then another singer then the chorus. The chorus really wasn’t as explosive as it should have been. I believe that the chorus is actually the heart of the song because that’s what the people usually remember. However, in this song, it wasn’t really that focused. But I gotta admit, it’s kinda catchy. After the first chorus, I just wanted to skip the whole “A-B-C-D-E-F-G” part because of the aegyo. The aegyo part is unnecessary and is out of place. It’s hip hop! Male hip hop. It reminded me of IGAB. Then another rap. They have two rappers? Cool. The rest of the song was pretty much the same as how it started. There wasn’t anything that explosive with it. But for some reasons, I’m hooked with it and kept on replaying the song. The MV is the typical “inside-the-box” MV where their backgrounds change. The whole MV is black and white and looks clean. I really like looking at it. However, there are some backgrounds which almost overpowered them to the point that you can’t see clearly their dance moves. Speaking of dance moves, their moves are clean and awesome. I just hope that they showed more of it in the MV. But they’re debuting soon so I’ll just wait for their debut stage.